This Hanukah menorah possesses the distinction of containing small glass cups to allow the lighting of oil Hanukkah lights, as opposed to Hanukkah candles. 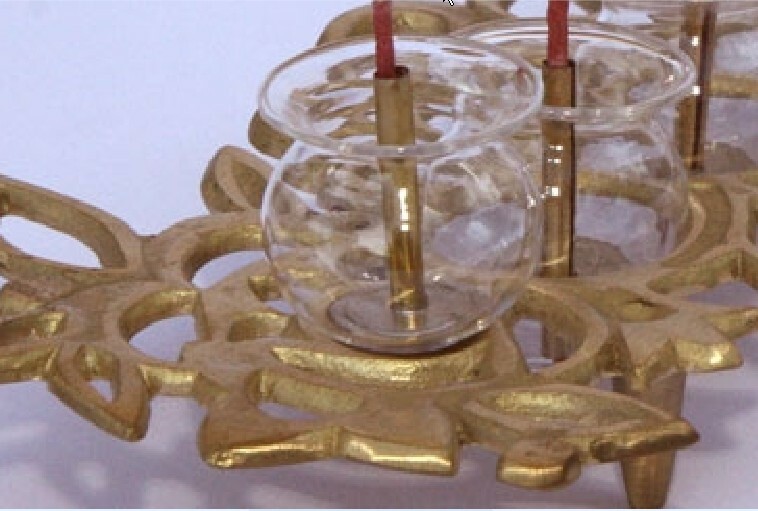 The glass cups are the centerpieces of a brass menorah bearing a lacy design. This is a piece of Israeli art and modern Israeli judaica not to be missed. The Jewish festival of Hanukkah (also spelled Hanuka, and pronounced Chanukkah in Hebrew) has long been one of the highlights of the Jewish holiday calendar. The spinning of dreidels (tops), exchange of Hanukkah gifts, eating of potato latkes (pancakes) and sufganiyot (jelly doughnuts) are great fun and something much looked forward to. However, without a doubt, the lighting of the Hanukkah menorah (also spelled menora and known as a Hanukkiah, or Chanukkiah in Hebrew) is the highlight of the festival. On the first night one candle is lit, and on each following night one candle is added until on the eighth and final night eight candles shine together harmoniously, joined by the ‘shamash’ (Hebrew for ‘helper’) which is used to light all the other candles and is then displayed alongside them. Did we say candles? Many menorahs, this one included, feature small glass goblets allowing the lighting oil lights, which is appropriately modeled after the lighting of the ancient menorah in the Jewish temple. 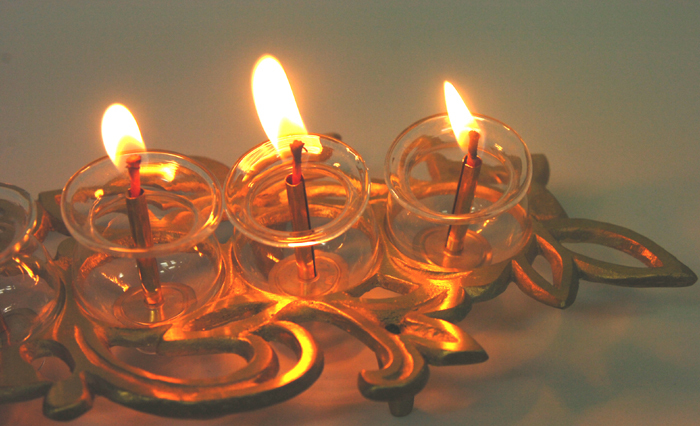 The lighting of the Hanukkah commemorates the lighting of the ancient menorah. After battling the Greeks’ for the right to religious freedom, and winning, the Macabees lit the menorah with enough oil to last only one day. Miraculously, the menorah remained lit for eight days, which is why Hanukkah is eight days long. Alim studio, home to some of the most creative and original pieces of Israeli art and judaica (Jewish ceremonial art) on the market, has created a stunning masterpiece. Brass is cut and shaped in a lacy design featuring elaborate curves and smooth edges, in the general shape of a rectangle. 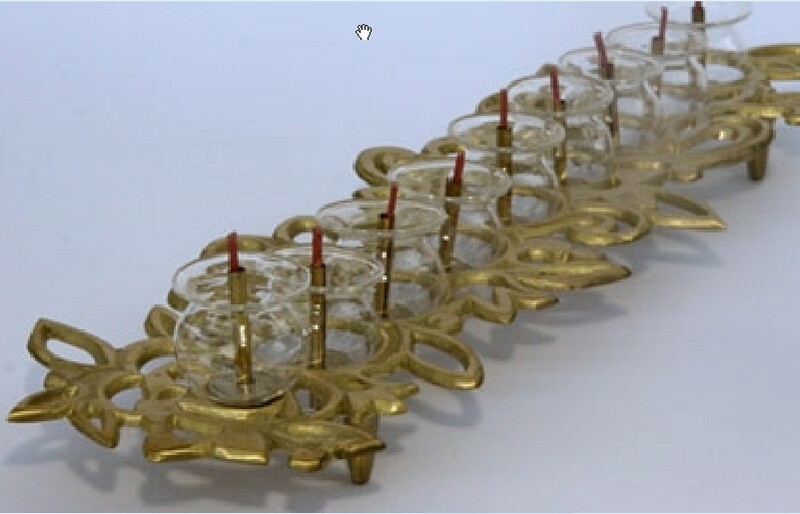 The weaving of the lacy pattern allows nine small glass goblets to be inserted along the center of the rectangle, to house to oil used to light the menorah. The entire menorah is supported by four small pegs lifting it off whatever surface it happens to be on. The lacy design is highlighted by images and shapes of The Seven Species of the Land of Israel. The overall effect of the light shining off the intricate design has to be seen to be believed; words cannot do the sight justice. Measuring 40 x 12 x 3 cm (16 x 4.8 x 1.2 inch), this menorah is the perfect Hanukah gift, anniversary gift, Bar or Bat Mitzvah gift, or gift to a lover of fine judaica and Israeli art.